For the long term, I wasn't particularly thrilled with the way the carrier Truman came in was set up. So I decided to start over and make a new one specific for him. I started by purchasing a small cat carrier at a typical pet store. Assembly was just the beginning of the makeover this carrier was about to get. I later added a food bowl ring to the carrier for being able to drop a food bowl in. I hung a toy from the cage top mesh and added a paper towel under the perch. The carrier was ready to go for testing. I brought Kili and Truman out for a family event in their respective carriers. I didn't feed them in the morning but instead let them eat in their carriers when I arrived. They were both hungry and ate marvelously. This served as an additional reward for being good in their carriers. I much prefer the top loaded carriers with a door on the top than the classic side door only ones. Not only do I find it easier to clean the carrier this way, but it is also much easier getting the parrot in and out. By opening the top I can reach the parrot no matter where it is in the carrier and it can step up. Whereas with a side door design, you have to wait for it to come out or reach deep inside for it. Also it is easier to add toys and food bowls through the top down as well. So I definitely recommend spending the little bit extra and getting a top door (or two door) carrier than a side door only design. Here is a video of the entire assembly process and all of the modifications I made for my parrot's new travel carrier. We've done the same thing. Although that's the carrier I use the least... If you do use the converted cat carrier a lot, I suggest adding metal washers to both sides of each hole you drilled. It will save the plastic from cracking as soon, since it absorbs the bit of banging that will happen (and it does happen, even if you don't notice it). If you only use the carrier for trips to the vet or odd emergencies, you can get by without the added reinforcement of the washers. I used washers for the food bowl and perch. I did not use washers for the additional clips I added. I travel with my parrots but not regularly enough to put heavy wear on the carriers. I have had Kili living out of her carrier for up to 3 days straight some times. I have the exact same model of carrier for my birds. I chose it for all the same reasons you mentioned. My birds really like it. I love the modifications that you've made, and I will do that to mine too. I usually just throw an old towel in the bottom, but the addition of the perch makes much more sense. For those that may not think it is necessary to do the extra zip ties . . . believe me it is! I have had the unfortunate experience of having the bottom of my carrier fall out and my bird along with it. It was in the parking lot of my Vet's office. I was very fortunate that Ozzy wasn't capable of flying at the time. Whew! What a scarey moment that was for Ozzy and for me. That was an economy carrier that I quickly replaced with this model. BTW . . . Nice workshop Michael. Thanks! I think the perch is an absolutely necessary addition. Otherwise the parrot is flung around inside the carrier and has nothing to grip on but worse yet keeps stepping in its own poop. Zip ties are necessary for keeping the carrier from coming apart whether your parrot is flighted or not. But for a flighted parrot I really suggest adding a second clip to each door (or zip tying temporarily) to prevent the door from flying open in the event the carrier is bumped or dropped. But with some parrot friendly modifications, this is a wonderful carrier and can be used as a home away from home. [quote="Michael":aykgs9ao][url=http://trainedparrot.com/index.php?bid=29&article=Building+Parrot+Travel+Carrier+For+Truman:aykgs9ao]Building Parrot Travel Carrier For Truman[/url:aykgs9ao] I bought a new carrier for Truman and this is about how I modified an ordinary cat carrier to be suitable for a parrot. [/quote:aykgs9ao] wow.. 'greyt' job!!! I have this one http://i196.photobucket.com/albums/aa218/ellenparrot/KOOIEN/P1010001bjpg_resize.jpg[/img:aykgs9ao] Yours is better I think, because they don't see everything when you travel. Yeah, I don't think the parrot should be so exposed on all sides. I like to give them a balance of visibility and hiding. That way they can look around but feel reasonably secure. 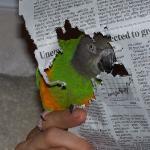 [quote="Michael":24f68sj9]Yeah, I don't think the parrot should be so exposed on all sides. I like to give them a balance of visibility and hiding. That way they can look around but feel reasonably secure. 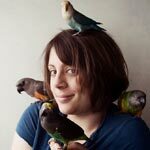 [/quote:24f68sj9] actually, I don't travel that much with my birds (visit to the bird vet or so) but it is a good point to reconsider! More perch space and less chance of them stepping to the bottom into their own poo. where did you get kili's crate? Pet shop. But once again I made my own modifications. I used a perch that I bought at a bird store so it had the bolt built in. I don't recommend just finding a branch outside because it may be a type of wood toxic to the parrot, contaminated, or contain bugs. So at most you may need to saw the perch you buy at the store to make it fit but you shouldn't have to attach a bolt. Just use the one built in. I just wanted to thank you Michael for all your great information, training tips and videos. I've built two Modified Deluxe Two Door Carriers for my current GCC and future ( ? - larger) bird per your video. Wow great job! I'm glad you found it helpful. 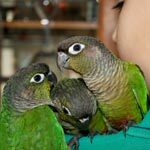 BTW, I have since written about [url=http://trainedparrot.com/Winter_Carrier:kevh2w5x]turning one of those into a double carrier for two parrots[/url:kevh2w5x]. I still totally recommend for having two separate carriers whenever possible. However, sometimes you only need to travel a small distance and can't bring two carriers and this is helpful. I use this for transporting my parrots in winter so they can keep each other warmer under an electric blanket. I also used it when I wanted to bring both to the vet and I needed to take the subway. There was no way I could have brought two carriers on a trip like that with me. BTW I can't tell, but I hope you made a safety clip for the top door. Considering that the entire weight of the carrier hangs from the top door, failure in the snaps would cause the carrier to fall open and bird to get scared and fly out. RE: Michael - Yes, it's hard to see in the subsampled photo, but both cages have different size perches, a water dish and a marine, brass spring-clasp to secure the top door. Aside from travel to the Vet, these are excellent for showing the bird(s) around the neighborhood so they'll be familiar with the area in case they escape and would like to fly home. I also like to take my GCC out for a walk/sit in the Sun so he'll be happier and healthier. I do have an Avian Sun UVA/UVB CFL bulb which I turn on for a few hours every afternoon/evening. Thanks again, Mark. Can anybody help me? I am looking to buy this pet carrier but cant seem to find one anywhere in the uk. If anybody knows where you can get one please help me out. [quote="RossBengough":9yn32uij]Can anybody help me? I am looking to buy this pet carrier but cant seem to find one anywhere in the uk. If anybody knows where you can get one please help me out. [/quote:9yn32uij] Have you tried just looking for a cat/dog carrier? hi michael i recently built a carrier for my out of wood. its kindof like a portable cage, so when i sleep over at a friends house i can bring the bird will the wood be hazardous to the bird?